As of December 31st 2005 the results are in. 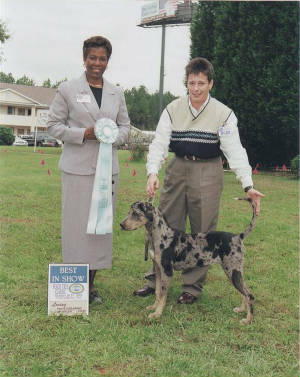 Jetta Catahoulas has two dogs in the top ten for UKC. 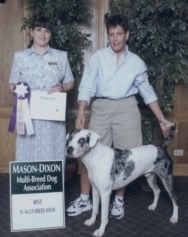 points from his last show of his UKC show career. CH Jetta's Gunner-Seeker 4th place inchingher dad out by one point. This is Seeker's second time in the top ten and she has moved up a few spots.. way to go baby girl!! 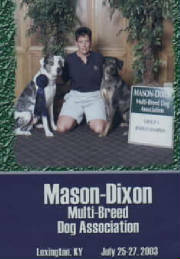 To Best in Breed with her daddy/ Gunner. 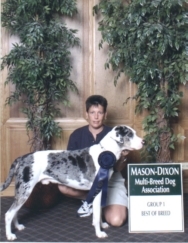 Gunner received his Grand Championship title July 23, 2004 in Lexington Kentucky at the Mason Dixon Multi-Dog Association Show! 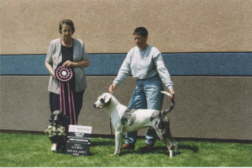 Blue Gunner Received his International Championship Title with Rarieties June 1st 2003. This Title Makes him a US/Canada Champion.